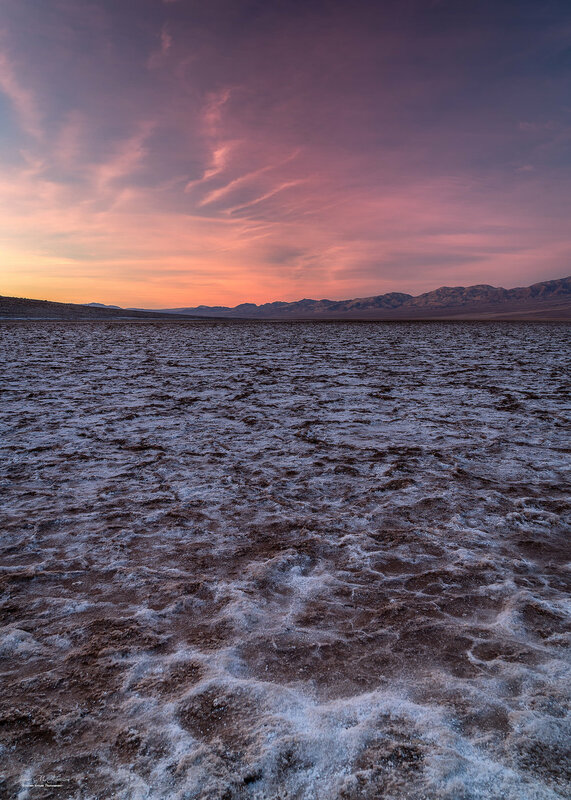 Sunrise looking southeast from the depths of Badwater Basin in Death Valley National Park, California, USA. 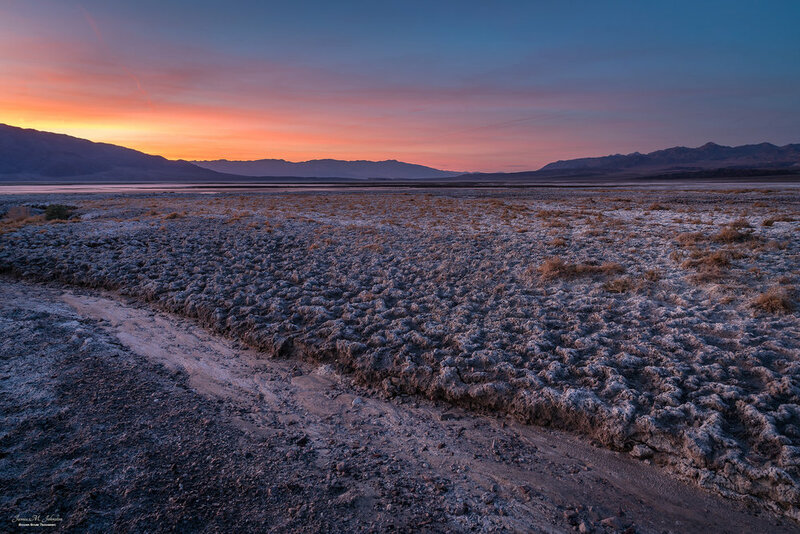 A new day dawns over Badwater Basin in Death Valley National Park, warming this cold winter morning scene. At 282 feet below sea level, this location is the lowest point in North America. 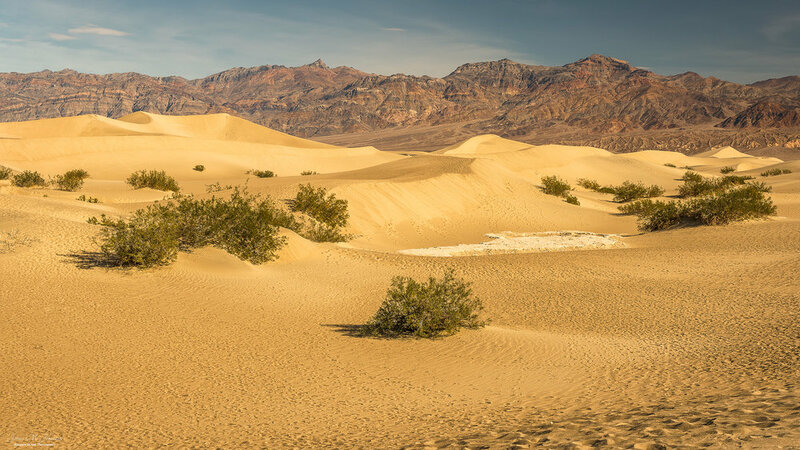 The surreal beauty of this location is something that should be experienced by everyone, just not during the summer when this National Park becomes the hottest place in the United States. This is a pano made up of 8 vertical shots. The file, once completed in Photoshop was 3.5 Gig and a monster to save. This crater is really cool. It is only 2000 years old, an infant by most geological standards. I loved the way the path swirled into and down to the bottom of the crater. A near full moon the night before the blue moon illuminates Badwater Basin in Death Valley National Park. It was 3:30 in the morning and the scene was lit so well I had to make an image. A muted sunset, seen from Zabriskie Point at Death Valley National Park. I had high hopes for a great sunset that afternoon but a line of clouds to the west put any chance at color out of the window. 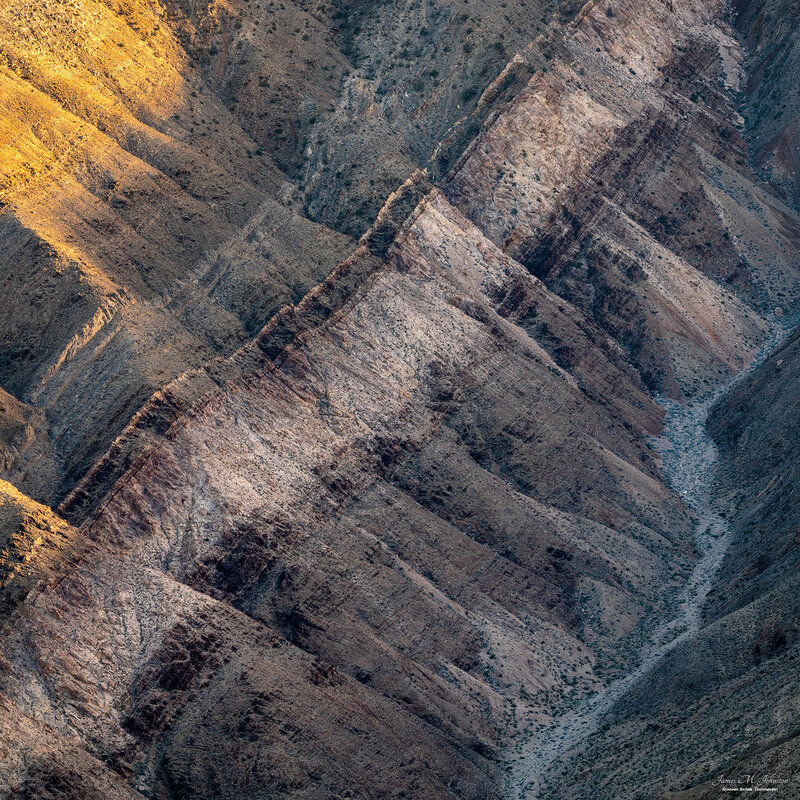 The Furnace Creek area of Death Valley National Park as seen from Aguereberry Point at sunset. A noontime wander on the dunes at Mesquite Flat with the Kit Fox Hills in the background. 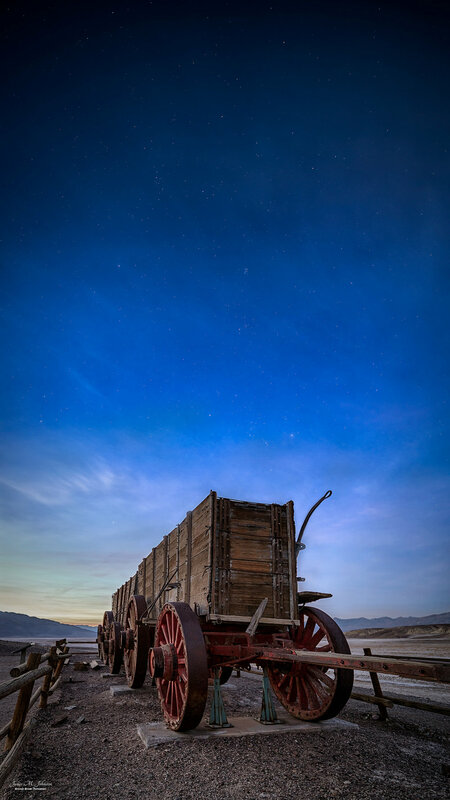 The surviving Harmony Borax wagons on display in Death Valley National Park. I was racing against time to get this shot as the sun had just barely set long enough to let the stars begin to shine bright but the near full moon was rapidly rising. I do like how the moon glow sets off the horizon to the left. This idea was one that I had placed high on my "must do" shots for this trip. I don't know whether the image is dramatic or subtle really, but I know I am very happy with how it turned out. If I ever get out here again I would like to do this with a milky way shot. That requires no moonlight. Sunset looking West-Northwest up the valley towards Stovepipe Wells. For those that have never been in the valley, the white stuff is salt that builds up as the valley floods and then dries up. This is a small taste of what you find in some spots that has been building for decades or more. Just North of Furnace Creek, looking south down Death Valley National Park. The setting sun worked it's magic to the south and lit up these grasses that seem to thrive in the salty environment. 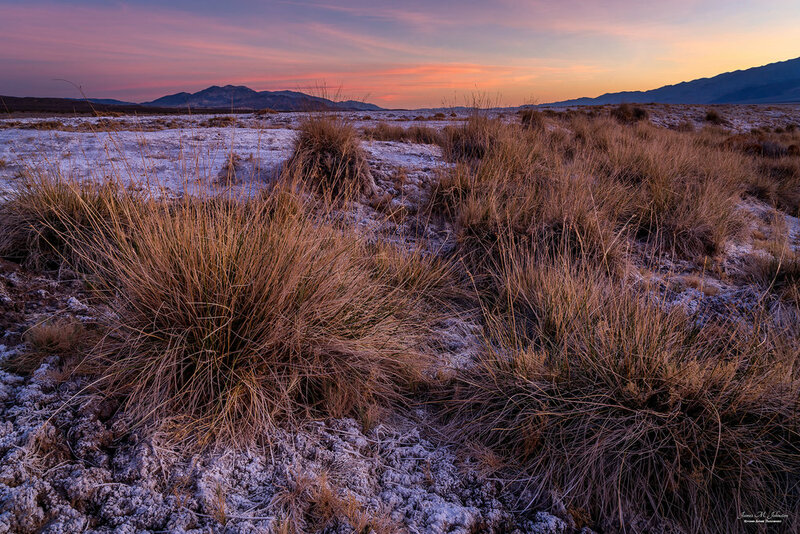 Sunset in Death Valley National Park at the Harmony Borax Interpretive Trail. 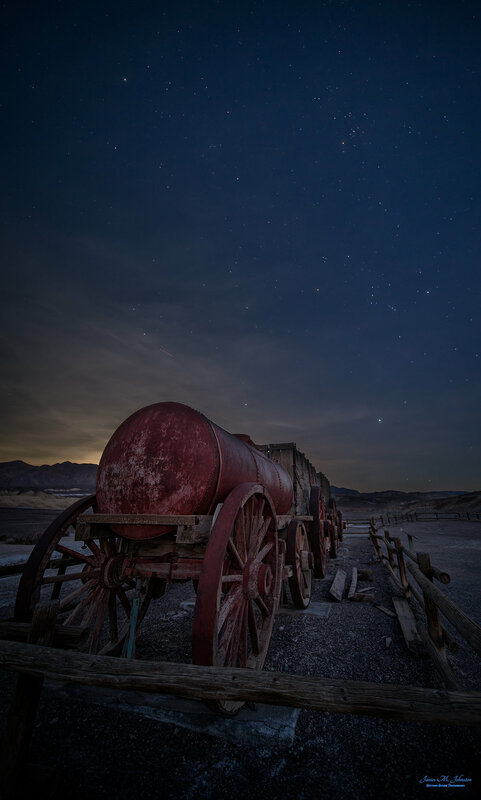 This is a display of three wagons from the old mine and makes for a great foreground for evening and night sky imagery as the tourists have gone by the time you set up for your shots. In the desert everything is in constant transition. Day to night, light to dark, wet to dry, active to dormant, golden hour to blue hour. The sky lit up with a true prismatic rainbow of color, all of which was reflected in the rapidly drying remains of a rainfall from a week past. In Death Valley, everywhere you look the theme is texture. Badwater Basin is no exception. Salt flats, mountains, rocks, sky, all giving a variety of tone and texture that I find visually appealing. Of all the things I saw while at the sand dunes, these dead tree trunks had the most artistic shapes. There were endless compositions to be had. 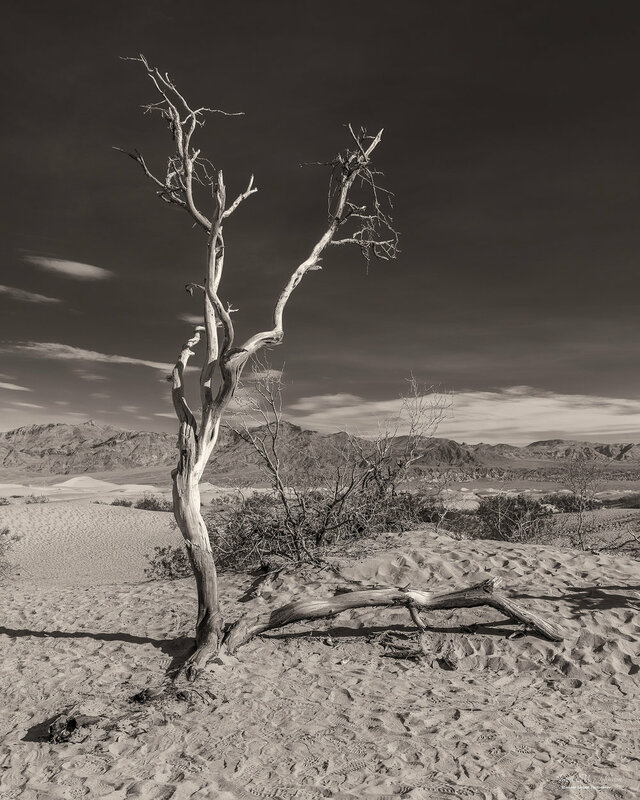 A dried out skeleton of a tree or bush lying in the gravel of Mormon Point, Death Valley National Park, California, USA. Other than stones and sand, this was almost all the eye could see. Looking down from Aguerreberry Point at sunset upon the eroded layers and strata that make up the mountain ranges west of Death Valley. In the desert it can be a fine line between trash and treasure. Abandoned items are preserved seemingly forever. Such is the case with this old beer can on the desert valley floor in Death Valley, California. I just had to make an image to further preserve this bit of history. Which will last longer, the can or the image? The distant hills and mountains that ring Death Valley, reflected in standing water at sunset.